Forging is defined as a metal working process that shape workpiece into desired dimensions by compressive forces applied through the use of dies and tools. Forging process is operated by hammering or pressing the metal. It is one of the oldest known metalworking processes with its origin about some thousands of years ago. At first,forging was complicated by a smith using hammer and anvil. Using hammer and anvil is a crude form of forging. The smithy or forge has been improved to become a facility with engineered processes, production equipment, tooling, raw materials and products to meet the demands of modern industry. In nowadays, industrial forging is done either with presses or hammers powered by compressed air, electricity, hydraulics or steam. Some examples of products obtained by forging process are-crane hook, connecting rod of an IC engine, spanner, gear blanks, crown wheel, pinion, etc. Forging process produces parts of superior mechanical properties with minimum waste of material. In this process,the starting material has a relatively simple geometry; this material is plastically deformed in one or more operations into a product of relatively complex configuration. Forging usually requires relatively expensive tooling. Thus, the process is economically attractive when a large number of parts must be produced and/or when the mechanical properties required in the finished product can be obtained only by a forging process. Although forging shows superior quality product compared to other metal manufacturing processes (casting, welding, machining, ect), there are still some defects that may lightly happen if a proper care is not taken in forging process design, defects can be defined as the imperfections that exceed certain limits. There are many imperfections that can be considered as being defects, ranging from those traceable to the starting materials to those caused by one of the forging processes or by post forging operations. Like drop forging, we could also see some drop forging defects in whole process. a) Cold forging: Forging is carried out at or near room temperature (below the recrystallization temp.) of the metal.Carbon and standard alloy steels are most commonly coldforged.Cold forging is generally preferred when the metal is already a soft, like aluminum. This process is usually less expensive than hot forging and the end product requires little or no finishing work. Cold forging is also less susceptible to contamination problems, and the final component features a better overall surface finish. Advantages: Production rates are very high with exceptional die life, Improves mechanical properties, Less friction between die surface and work piece, Lubrication is easy, No oxidation or scaling on the work. Disadvantages: Residual stress may occur,Heavier and more powerful equipment is needed,Stronger tooling is required,Tool design and manufacturing are critical. 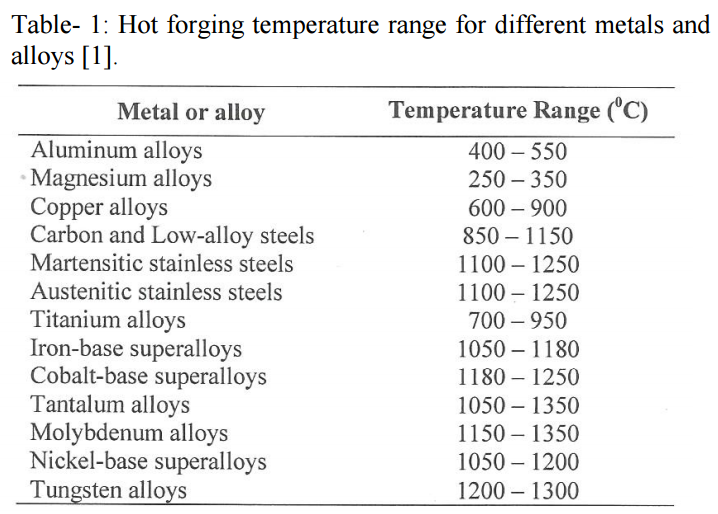 b) Warm forging:The temperature range for the warm forging of steel runs from above room temperature to below the recrystallization temperature.Compared with cold forging, warm forging has the potential advantages of:Reduced tooling loads,reduced press loads, increased steel ductility, elimination of need to anneal prior to forging, and favorable as-forged properties that can eliminate heat treatment.In warm forging, the billet is heated below the recrystallization temperature, up to 700 to 800 0C for steels, in order to lower the flow stress and the forging pressures. Advantages:High production rates,Excellent dimensional tolerances and surface finish for forged parts,Significant savings in material and machining,Favorable grain flow to improve strength,Greater toughness of the forged part. c) Hot forging (most widely used): Forging is carried out at a temperature above the recrystallization temperature of the metal.The recrystallization temperature is defined as the temperature at which the new grains are formed in the metal. This kind of extreme heat is necessary in avoiding strain hardening of the metal during deformation. Advantages: High strain rates and hence easy flow of the metal, recrystallization and recovery are possible, forces required are less. Disadvantages: Lubrication is difficult at high temperatures, oxidation and scaling occur on the work piece, poor surface finish, less precise tolerances, possible warping of the materialduring the cooling process. a) Open-die forging: Forging in which the flat dies of simple shape are used to allow the material to freely deformed in lateral directions of applied load. Below shows open-die forging operation. Features: open die forging is only suitale for simple shapes for its less dimensional accuracy, there is high requires on the skill of operators, the dies of open die forgings are simple and less expensive, which is simplest of all the forging operations. b) Closed-die forging (also called impression die forging): Forging in which the material is fully constrained in the cavity created by the upper and lower die halves. It allows more accurately shaped parts to be formed,higher interface pressures required,requires very accurate control of material volume and proper die design. Closed-die forging is a form of impression-die forging,which does not depend on flash formation to achieve complete filling of the die. Material is deformed in a cavity that allows little or no escape of excess material, thus placing greater demands on die design. Features: Work is rough forged close to final shape by blocking die, work is forged to final shape and dimensions by finishing die, both blocking die and finishing die are machined into the same die block, more number of dies are required depending on the complexity of the job, two die halves close-in and work is deformed under high pressure,high dimensional accuracy/close control on tolerances, suitable for complex shapes, dies are complex and more expensive,large production rates are necessary to justify high costs. Die design parameters: Die design depends on the knowledge of strength and ductility of work piece material, sensitivity of material to the rate of deformation and temperature, frictional characteristics, shape and complexity of work piece, die distortion under high forging loads. Die material requirements: Strength and toughness at elevated temperature, Hardenability and ability to harden uniformly, Resistance to mechanical and thermal shocks, Wear resistanceto resist abrasion wear due to scales present on work piece. Selection of proper die material depends on: die size, composition and properties of work piece, complexity of shape No. of performing steps, forging temperature, type of forging operation, cost of die material, No. of forgings required, heat transfer from work piece to dies, etc. Die materials used: tool and die steels with Cr, Ni, Mo, Va. Forged components are shaped either by a hammer or press. Forging on the hammer is carried out in a succession of die impressions using repeated blows. The quality of the forging,and the economy and productivity of the hammer process depend upon the tooling and the skill of the operator. In press forging, the stock is usually hit only once in each die impression and the design of each impression becomes more important while operator skill is less critical. The continuous development of forging technology requires a sound and fundamental understanding of equipment capabilities and characteristics. The equipment i.e. presses and hammers used in forging, influences the forging process, since it affects the deformation rate and temperature conditions, and it determines the rate of production. The requirements of a given forging process must be compatible with the load, energy, time, and accuracy characteristics of a given forging machine. 1) Hammer forging: The most common type of forging equipment is the hammer and anvil. The hammer is the least expensive and most versatile type of equipment for generating load and energy to carry out a forging process. This technology is characterized by multiple impact blows between contoured dies. Hammers are primarily used for hot forging. There are basically two types of anvil hammers: Gravity-drop hammers and power drop hammers. In a simple gravity-drop hammer, the upper ram is connected to a board (board-drop hammer), a belt (belt-drop hammer), a chain (chain-drop hammer),or a piston (oil-, air-, or steam-lift drop hammer).The ram is lifted to a certain height and then dropped on the stock placed on the anvil. During the down stroke, the ram is accelerated by gravity and builds up the blow energy. The upstroke takes place immediately after the blow. The operation principle of a power-drop hammer is similar to that ofan air-drop hammer. In the down stroke, in addition to gravity,the ram is accelerated by steam, cold air, or hot air pressure. In the power-drop hammer, the acceleration of the ram is enhancedwith air pressure applied on the top side of the ram cylinder. 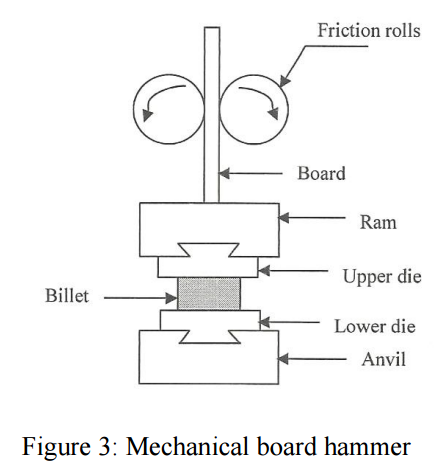 Figure 3 shows mechanical board hammer- It is a stroke restricted machine. Repeatedly the board (weight) is raised by friction rolls and is dropped on the die. Its rating is in the terms of weight of the ram and energy delivered. 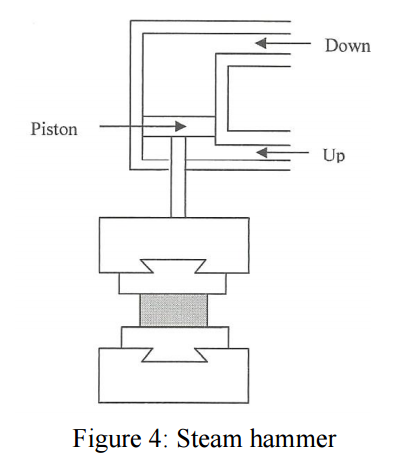 Figure 4 shows steam hammer- It uses steam in a piston and cylinder arrangement. It has greater forging capacity. It can produce forgings ranging from a few kgs to several tones. It is preferred in closed-die forging. 2) Press forging: In press forging, the metal is shaped not by means of a series of blows as in hammer forging, but by means of a single continuous squeezing action. There are two main types:mechanical and hydraulic presses. Mechanical presses function by using cams, cranks and/or toggles to produce a preset (a predetermined force at a certain location in the stroke) and reproducible stroke. Due to the nature of this type of system,different forces are available at different stroke positions. Mechanical presses are faster than their hydraulic counterparts (up to 50 strokes per minute). Their capacities range from 3 to 160 MN (300 to 18,000 short tons-force). Hydraulic presses use fluid pressure and a piston to generate force. Figure 5 shows hydraulic press.It is a load restricted machine. It has more of squeezing action than hammering action. Hence dies can be smaller and have longer life than with a hammer. Features of Hydraulic Press: Full press load is available during the full stroke of the ram, ram velocity can be controlled and varied during the stroke, it is a slow speed machine and hence has longer contact time and hence higher die temperatures, the slow squeezing action gives close tolerance on forgings, initial cost is higher compared to hammers. The advantages of a hydraulic press over a mechanical press are its flexibility and greater capacity. The disadvantages include a slower, larger, and costlier machine to operate. Thanks for the articles. It's a valuable information, again thanks for sharing. the both are same or not. Please share you opinion on it. this is nice information but i have also same doubt. Can you give temperature at witch all of these three forging operation can done. For automobile industries small components weighing between 1 to 5 kgs with complex shapes having requirement from 2000 parts per montth.